The Embassy of the Sovereign Order of Malta to Slovenia provides aid to poor families and communities The economic crisis of the recent years has affected many families, but also communities, which provide shelter and re-education of individuals in the Republic of Slovenia. Therefore, they always welcome shipments of food, beverages and other consumer goods, including toys, provided by the Embassy of the Sovereign Order of Malta in Ljubljana led by the Ambassador His Sincere Highness Hugo Prince of Windisch-Graetz. 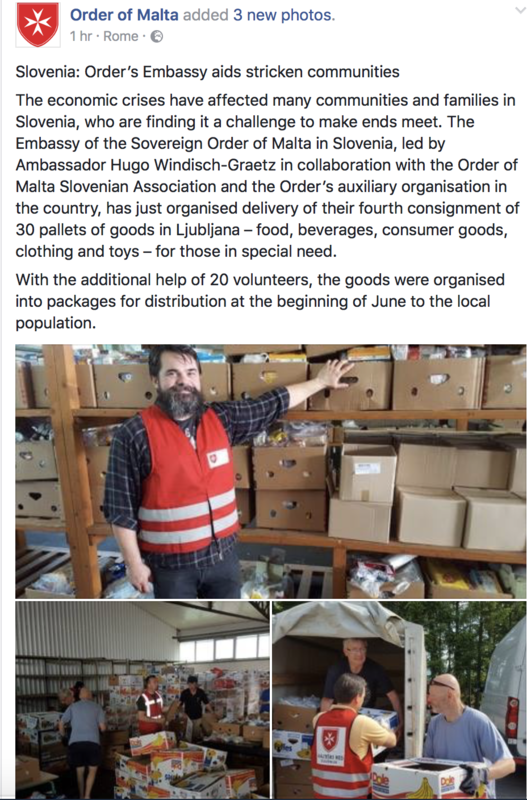 The Slovenian Association of the Sovereign Order of Malta and its national auxiliary Order of Malta Aid have four times organized an operation of sorting of thirty pallets of goods of the April shipment in aid packages, which will be distributed to those in need in the first days of June. All operations were attended by more than twenty volunteers, who will bring joy to families and a smile on the faces of individuals, especially children.